Catalogs is rated 5.0 out of 5 by 3. Catalogs are really useful for promoting a business. "We use our small catalogs for trade show handouts and also for mailers. We like to use PrintPlace.com because you always do good work, you are always on time, and there is never a hassle… and you do it cheaper than most places!" Rated 5 out of 5 by Anne from gorgeous printing We print lots of catalogs with Printplace as quality and price are second to none. Easy to upload and proof files - fair pricing on product though we think the shipping is very high! Rated 5 out of 5 by HNOSBORNE from Catalog My company purchased a 44 page catalog. They came out nice. We had some problem on the upload however print place was very helpful. Rated 5 out of 5 by BobG from Always Happy with Print Place Always get fast service, agreeable assistance, outstanding quality and no-hassle pickup... love Print Place! 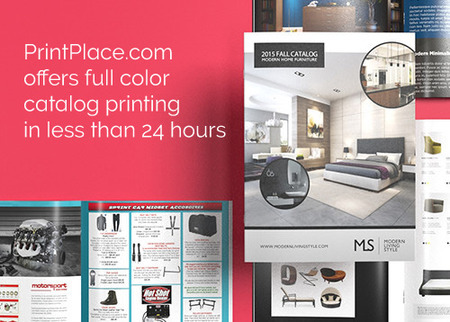 Full-color catalog printing online at PrintPlace is fast yet affordable. How fast? They can be printed the same day we receive your order. Are our catalogs customizable? Yes, they are. We give you the options to design and show off your business in style. Your catalogs can be filled with all the information your customers might need to make a purchase. You can feature special offers and highlight "best selling" products to entice sales. Because of our flexible quantity options, you can print short run or in bulk. When you are ready to order, use our easy online ordering tool to choose your paper options, page counts, tabbing options and more. In a hurry? Choose same day turnaround (before Noon CT) and your job will print the same day it's ordered. Call us for additional custom options such as perfect binding or coil binding, or fill out our custom order form. To make sure your artwork prints correctly, use our catalog layout templates for the right specifications. Just download the file in the format you need. It will help set up your file for optimal results. We offer both printing and mailing services on PrintPlace so you can save valuable time and money. Our catalog mailing services include inkjet addressing, presorting your list for automated postal discounts and removal of duplicate addresses if requested. You can save postage by planning ahead and printing catalogs that meet letter rate standards. Letter rate postage will save you quite a bit over flat rate, for an entire mailing. Using landscape oriented catalogs though, requires extra tabbing for letter rate. You can avoid this extra cost though by designing and printing catalogs with portrait orientation. Mailing catalogs at flat rate does not require tabbing, but the postage cost is higher than letter rate. Click below to learn more about requirements for mailing flat and letter rate catalogs. Marketing with printed catalogs is an excellent way to take your products directly to customers. To make the most of them, take a little time to pick the right paper and coating options that will make the biggest impact. Some industries that rely on catalogs include auto service, beauty and wellness, education, real estate, and restaurants. Uncoated pages are good for catalogs with a lot of text because they are easier to read. Glossy pages show off color catalog images more vibrantly.